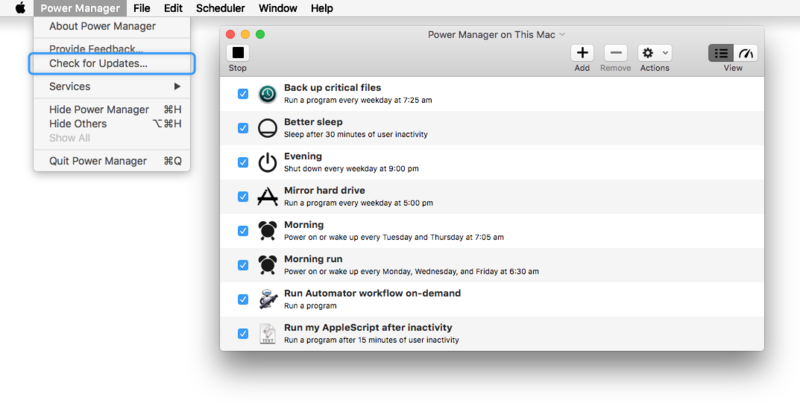 We are pleased to announce the launch of Power Manager and Power Manager Pro 4.5.1. This update introduces a new experimental application trigger and many interface refinements. Our work on the internal scheduling engine has continued to ensure it remains modern and efficient. New: Added Spotlight support for .pm-schedule files; .pm-event already supported. New: Added option to use enhanced or plain script editor; default boolean colourScriptEditorSyntax. Change: Supporting tool pmctl no longer requires PowerManager.framework. Change: Supporting daemon pmuser no longer requires PowerManager.framework. Change: Linked pmuser against AppKit for workspace notifications. Change: Updated more external links and documentation to https://.